Based on spectroscopic observations taken with the William Herschel Telescope (WHT) in 2015, astronomers from the Department of Physics and Astronomy at the University of Sheffield have found the first evidence for a stellar tidal disruption event (TDE) in a galaxy with a massive on-going starburst. Until now, TDEs — in which stars are ripped apart by supermassive black holes in the nuclei of galaxies — had been found in surveys of many thousands of galaxies, and the rate deduced for such events was low: one event every 10,000 to 100,000 years per galaxy. However, the Sheffield team detected a TDE in repeat WHT spectroscopic observations of a sample of just 15 ultra-luminous infrared galaxies (ULIRGs) over a period of only 10 years. Since ULIRGs represent the peaks of major galaxy mergers, this suggests that the rate of TDEs is substantially enhanced in mergers. 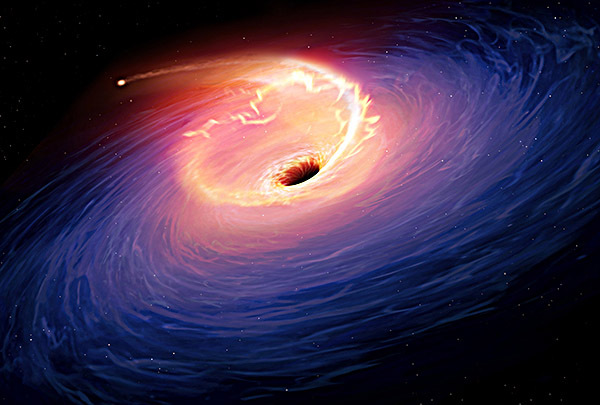 Artists impression of the tidal disruption event in F01004-2237. Credits and copyright: Mark Garlick. Large format: JPG. The team first observed the 15 ULIRGs in the sample with WHT/ISIS in 2005, during a project to study merger-induced star formation. However, when they observed the sample again in 2015 — this time to study the outflows driven by the active galactic nuclei (AGN) triggered in the mergers — they noticed that the nuclear spectrum of one galaxy (F01004-2237) appeared strikingly different. In particular, the object showed unusually strong and broad helium emission lines. Comparison of the optical spectrum of F01004-2237 taken in September 2015 using the ISIS spectrograph on the WHT with that taken in September 2000 using the STIS spectrograph on the Hubble Space Telescope (HST). Note the detection of a broad component to the HeI 4686Å emission line in 2015 that is not visible in the Hβ and Hγ Balmer lines. Large format: GIF. Alerted to the possibility of an unusual transient event, the team then searched the Catalina Sky Survey database for evidence of variability, and discovered that F01004-2237 (z=0.117835) underwent a spectacular flare in its optical V-band light in 2010. Catalina Sky Survey (CSS) light curves for F01004-2237 (solid blue points) and the other 14 ULIRGs in the spectroscopic sample (black dotted lines and red dashed line). Note that, whereas F01004-2237 has shown a substantial flare in its V-band brightness (ΔmV=0.45±0.02 mag) over the ~10 years of the survey, none of the other sources have shown similar flares. The data used are available from the CSS data release 2 website. Large format: GIF. The particular combination of variability and post-flare spectrum observed in F01004-2237 is unlike any known supernova or AGN, but is characteristic of TDEs. According to Clive Tadhunter, who led the research: "The enhanced rate of TDEs in major galaxy mergers is likely to be due to a combination of the high stellar densities associated with the circum-nuclear starbursts, and the movement of the two supermassive black holes from the progenitor galaxies through these dense star fields as they merge together." The study, published in the journal Nature Astronomy, was supported by a grant from the UK Science and Technology Facilities Council. C. Tadhunter, R. Spence, M. Rose, J. Mullaney, P. Crowther, 2017, "A tidal disruption event in the nearby ultra-luminous infrared galaxy F01004-2237", Nature Astronomy, 1, id. 0061 [ ADS ].